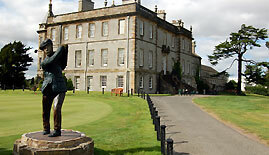 Golf at Dalmahoy dates back to the 1920s, but the fabulous manor house is much older. It was built in the late 1720s, for the Earl of Morton, and, in 1990, it was extended and converted into a hotel and country club. The East course was designed by the great James Braid, and it’s set amongst 1,000 acres of rolling, wooded parkland. It’s a glorious setting, affording fine views of the nearby Pentland Hills. Dalmahoy has a mixed parkland and moorland feeling, with hilly ground in places. The slopes can make for some challenging lies. This championship course is maintained immaculately, from tee to green, and it’s a significant test – just ask the American Solheim Cup team. Here, in 1992, Catrin Nilsmark sank the winning putt, famously sealing Solheim Cup victory for Europe – 11½ 6½. Measuring more than 6,800 yards from the back tees, par 73, the East is certainly no pushover. There are some great holes to be played, especially on the back nine. The 17th, ominously named “The Wee Wrecker”, will test your skill and courage. It’s a heavily bunkered course, and this tough par three is no exception – five huge bunkers guard the green – a challenging and exacting tee-shot is required. Concentration is needed at the tree-lined 18th, a long par four. A solid, straight drive will leave a tough approach shot across a gorge to a well-bunkered green. Dalmahoy Hotel & Country Club oozes class and we thoroughly recommend the stylish East course. It has been 15 years since I played the East course this last June and I was interested to find out whether the harsh reviews posted for the course were actually true. I wasn’t a great fan of the East course to start with, but feel the renovations have not adversely impacted the course at all. OK it’s a resort course and the Marriott badge is not very prestigious these days but from a golfing perspective the East is a proper test and I didn’t find it a grind at all. Overall I wouldn’t be put off by scathing reviews from those who simply don’t like change or have an axe to grind. The course condition was good and I played in a two-ball in less than 4 hours on a Sunday. The West course is a little cracker which we also enjoyed. Dalmahoy is not a bad place to stay when in Edinburgh – I’d stay and play there again. This course was one of the best in the Lothians, regularly hosting European Tour events however it passed from being a members club to eventually owned by an international hotel group. The course was lenthened by some grim changes. presumably with a view to attracting back big events which has not happened. The result is a long uninteresting grind. It is overplayed and the last time I was there in terrible condition, so bad we quitted at the 9th. A first class course ruined. For a supposed top course charging top prices it is in terrible condition. Virtually every fairway had GUR areas. Some of the tee boxes would shame a council course. There were even several petrol burns on fairways and across two of the greens which is inexcusable. Perhaps they should invest some of their bar price profits into a large sack of grass seed for the greenkeeper. I was looking forward to playing Dalmahoy East on the Wednesday preceeding the start of the Open Championship at Muirfield. It was no doubt a classic parkland course but was unfortunately in a very bad condition. The fairways were in a poor state, whether as a result of the dry weather, over use or just a lack of maintenance. However, the main problem was the state of the greens - you do not expect to find hollow-tined greens in July. The fairways were quite generous in terms of width off the tee but the greens were very well protected by James Braid's design for the surrounding bunkers. Any approach shot which was not really accurate was punished. I would like to play the course again but would not re-visit until I had an assurance that the condition had improved considerably. I think it’s a touch unfair to overly emphasise the length of the course. Yes it is pretty long but it is also relatively generous, you can give it a proper bash off the tee without too many worries. I agree with the comments of J. McCann in that this would be a much better place if it was a members club, like all resort courses it feels more like a corporate money maker.Overall I had a decent day out but felt the course was a touch boring, condition was ok, nothing special in my opinion I’m afraid. Worth a look if you can get a deal or signed on by a member but I would not pay full green fee. There are many better courses around that I would recommend before here. I find alot of the reviews of the East course somewhat unfair. Corporate golf, boring..etc.. I personally have played twice (both of tiger tees, (shot mid/low 80's) and will play again. DO NOT play if you find monster courses a nightmare. This is a LOOOONG course and as such will take the fun out of golf for alot of people. My playing partners here have ranged from +1,2,11,15 and 21 handicaps, and it is no surprise that the 15 and 21 handicapers just found it too long, but they could at least appreciate the beauty and condition. Dalmahoy is a nice course that was probably a better course when it was shorter but still well worth playing. 9th, 13th and 18th are the pick of the bunch. A disappointing start when my free voucher from Golf Care Insurance was rejected as I was part of a corporate booking. No mention of this on the terms and conditions and accepted on a telephone query the day before ! After a greasy, wretched bacon roll I did enjoy the round of golf. Beautiful parkland course but, sadly, in a scruffy condition. Mown grass left in the bunkers, some greens in very poor conditions made for a disappointing and expensive experience. After the round you can relax in the bar with a ludicrouslyl priced drink. I will not return. Well, what can I say about Dalmahoy east? ?It's long. And it's long. And eh, it's very long.Not much to really get excited about until the 13th. Have played some far better value for money courses than this and wouldn't hurry back to pay full price here.